The Cariboo Chilcotin offers countless lakes with some of the best sportfishing for rainbow trout and other game fish. Check the lakes below and book a lakeside vacation at a Cariboo Chilcotin resort. Abbott Lake: Abbott Lake is approximately 55 km(34.1 mi) from Williams Lake. The game fish in Abbott Lake are Rainbow Trout and Char, the rainbow trout will go to seven pounds. Abuntlet Lake: Abuntlet Lake is 322 km (199 mi) west of Williams Lake on Highway 20. Flyfishing is best at the outflow into the Dean River. Alexis Lake: To find Alexis Lake travel 10 km (6.2 mi) west of Alexis Creek. At this point take the road that branches north off Highway 20. Alexis Lake is another 25 km (15.5 mi). Alexis is a consistent producer of 12 inch rainbows from May through October. Anahim Lake: This popular fly fishing lake is located 322 km (199.64 mi) west of Williams Lake on Highway 20. Anahim Lake reports an average of 14 to 16 inch wild stock trout reaching up to 3 lbs. Batnuni Lake: This 9 km (5.5 mi) long lake is reached by taking the Blackwater River Road northwest from Quesnel. 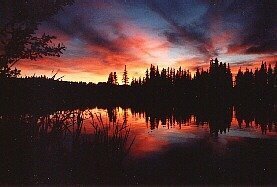 This semi-wilderness lake sports good fishing for a variety of fish such as Rainbow, Kokanee, Dolly Varden, Lake Char. Beaver Lake: Beaver Lake is about 21 km (13 mi) west of Riske Creek, turn north off Hwy 20 onto the Palmer Lake Forest Access Rd. Travel this road and then turn north off the Palmer Lk Rd. Lots of large rainbows are the order of the day at Beaver Lake. Big Lake: Big Lake is located on the Likely Road about 40 km(25 mi) from 150 Mile House. Trophy size Lake Char of 30 lbs and better have been caught in Big Lake. Kokanee and rainbow averaging in the 1 - 2 lb range are common, with some rainbows weighing as much as 12 lbs or better. Bonaparte Lake: At the Bridge Lake store, turn right (south) on to a gravel road (stay left at the Y) this will take you to Eagan lake. Just past Eagan, take the left road at the Y and follow it to Bonaparte. Bonaparte Lake is capable of producing rainbows in the l2 lb range with 3 to 4 lb trout being the norm. Small kokanee are also around. Bouchie Lake: Bouchie Lake is located west of the city of Quesnel across the Fraser River. Travel up the paved Nazko road for approximately 13 km (8mi) to this popular fishing lake which has a number of full time residences. Late May to October produces pan-sized rainbow at Bouchie Lake. Bowers Lake: Follow Hwy 24 to Sheridan Lake. Turn north to Needa Lake. Bowers is located a few miles north of Needa on the same road. Bowers Lake is a very highly recommended lake, producing wild stock rainbows to 2 lbs all summer long. Bridge Lake: From 100 Mile House, travel south on Highway 97 until you reach the junction of Highway 24. Turning east on this paved road will take you to a multitude of resort and fishing lakes. Bridge Lake is located approximately 48 km (30 mi. mi) along this scenic, lake dotted route. This 7 km (4 mi.) long lake can produce rainbows up to 5 lbs, kokanee to 4 lbs and lake trout to 20 lbs. Canim Lake: From 100 Mile House, proceed north on Highway 97. At the top of the hill as you are leaving town, turn east on the Forest Grove/Canim Lake Road. At the intersection in the community of Forest Grove, turn right and proceed to Canim Lake. Rainbow Trout, Lake Trout and Kokanee are the game fish in Canim Lake. Charlotte Lake: This 20 km (12.4 mi) long and 6 km (3.72 mi) wide lake is located south of Nimpo Lake on the Pine Point Resort road. After 10 km (6.2 mi) you branch south for another 20 km (12.4 mi) to reach the lake. Even though the average rainbow trout may reach 4 to 5 lbs at Charlotte Lake, much larger ones are often caught. Chaunigan Lake: At Williams Lake turn west onto Hwy 20. Follow this road Hanceville (a.k.a. Lee's Corner). Turn south off Hwy 20, cross the bridge over the Chilcotin River and follow the Taseko Lake Road. Chaunigan is a very special lake, surrounded by spectacular scenery and offering exceptional fishing. Chilko Lake: Follow Hwy 20 west from Williams Lake to Tatla Lake. Turn left (south) onto the Bluff Lake road and drive for 4.2 km (2.6 mi.). Keep left on the Tatlayoko Lake Road to the Chilko Lake Road. Chilko contains big fish, the Bull Trout can go to 10 lbs and the rainbows to 6 lbs or better. Clearwater Lake: Travel about 245 km. (152 mi.) west of Williams Lake on Hwy 20. Clearwater is on the south side of Hwy 20 with easy access right to the lake. Clearwater is a steady producer of wild stock rainbows in the 2 lb range. Crazy Bear Lake: This lake is located 35 km. (22 mi.) south west of Nimpo Lake over the famous Atnarko River. The average rainbow trout will reach between 14" and 20". Crystal Lake: This beautiful and small lake can be found approximately 5 kms (3 mi) southwest of neighbouring Bridge Lake on Hwy 24. Crystal Lake is known to be a good producer of trout up to 4.4 lbs. Although, a 14 lb rainbow is on record. Deka Lake: South of 100 Mile House, you turn east on the Horse Lake Road. Deka Lake is located northeast of Sheridan Lake. Lake trout are caught up to 10 lbs with rainbow about a 1 1/2 lbs at Deka Lake. Dragon Lake: About 4.2 km (2.6 miles) south of the city of Quesnel. Turn east off Highway 97. Dragon Lake is one of the jewels of the Cariboo, home of trophy size rainbows. Twelve pounders are caught on a regular basis and because of such great fishing, this lake is often featured on TV fishing programs. Drewry Lake: North of 100 Mile House, turn east off Highway 97 to the Forest Grove/Canim Lake Road. The road turning east at Buffalo Creek will take you to this 14 km (8 1/2 mi.) long lake.Wild stock rainbows of up to 4 lbs can be caught at Dewry Lake. Dugan Lake: Turn off Hwy 97 onto the Horsefly Rd. at 150 Mile House. Approx. 2.41 km (1.5 miles) past the junction of the Horsefly and Likely Roads, you will turn off the Horsefly Rd onto the Dugan Lake Rd. This is a highly productive lake, with rainbows and brook trout. Eagan Lake: Follow Hwy 24 to the Bridge Lake Store. Turn right (south) onto a gravel road, staying on the left branch of the fork in the road. Follow this road to Eagan. The game fish in Eagan Lake are Rainbow Trout. Eagle Lake: From Williams Lake, turn west onto Hwy 20. Continue past Chilanko Forks and the Pyper Lake turnoff. Continue on Hwy 20 watching for a well marked road to Eagle Lake on the south (left) of the highway. 2 lb rainbows seem to be common with the odd fish going up to 8 lbs at Eagle Lake. Elk Lake: North of Williams Lake on Hwy 97. Upon reaching McLeese Lake, turn right on the McLeese Lake-Likely Road. Elk Lake is located about 22 Km (14 mi) along this good gravel road. Elk Lake is considered as one of the best fly fishing lakes for Rainbow trout. Fawn Lake: From Lone Butte continue east on Hwy 24 for another and you will see Irish Lake on the right (south side) of the road. The turn off to Fawn Lake is just past Irish Lake as you continue east on Hwy 24. Watch for the signs on the left (north side) of the road. Fawn is a small but very productive rainbow lake. Fishem Lake: At Hanceville take the Taseko Lake road south until you reach the Lord River Development road. Turn south onto the Lord River Development road and travel to an intersection just past Yohetta Creek. At this intersection, turn left and drive 0.5 km (0.3 mi.) and then turn right and continue to Fishem Lake. Fishem produces small wild stock rainbow and bull trout. Fishpot Lake: From Quesnel, turn off Highway 97 onto the Nazko Road. Branch west from the Nazko store. Fishpot is capable of producing rainbow trout up to 7 lbs. Forest Lake: Excellent rainbow lake. Most fish are in the 4 - 8 lb. range. Catch and release is strongly encouraged on this lake, as during the warm days of summer, the fish take on a 'muddy' taste. Green Lake: Located about l3 kms. (8 miles) east of 70 Mile House, Green lake is an outstanding family lake. Situated amongst rolling hills of meadows, aspen and pine, this beautiful lake shines of Caribbean blue/green colors. With water that is incredibly warm, some of the best beaches in BC and 2 fabulous provincial park campsites, Green lake is a jewel for vacationing families. Greenlee Lake: Travel north of 100 Mile House on Highway 97 to the Forest Grove/Canim Lake Road. Travelling east, you continue on this road to Canim Lake. Greenlee Lake is located on the north west side of Canim Lake. Exceptional rainbow trout are found at this popular get-away spot. Hathaway Lake: Drive to the southern edge of 100 Mile House, then east onto the Horse Lake Road. Hathaway Lake is located north of Sheridan Lake. The game fish at Hathaway Lake are Rainbow Trout, Lake Trout and Char. Helena Lake: From 100 Mile House, follow Highway 97 north past Lac La Hache. At the north end of the lake take the Wright Station Road west; continue to take the road to your left. Continue past Phillilloo Lake. Rainbows on average are around 2 lbs with 10 pounders occasionally being taken at Helena Lake. Horn Lake: At Williams Lake, turn west onto Hwy 20 and follow it to the small community of Tatla Lake. Turn south onto the Tatlayoko Lake Road, and then turn west (right) onto the West Branch Road. Rainbow and Bull Trout are the game fish in Horn Lake. Horse Lake: From 100 Mile House travel east for 8 km (5 mi.) on the paved Horse Lake Road. This 18 km (11mi.) long lake is a popular holiday spot as well as being a desirable residential area. May to October can produce 2 lb rainbow, 3 lb lake trout and kokanee up to 1 1/2 lbs. Horsefly Lake: From Horsefly cross the Horsefly River bridge. Travel east for 1.3 km (0.8 mi) then turn left onto the Quesnel Lake Rd. Lake Char, Dolly Varden, Rainbow Trout, and Kokanee are the game fish in Horsefly Lake. Hotnarko Lake: From Williams Lake, follow Highway 20 to Anahim Lake. Just west of Little Anahim Lake branch south onto a rough road to the lake. Hotnarko Lake is capable of producing large wild stock rainbow. Howard Lake: From 100 Mile House, travel north on Highway 97. At the top of the hill, turn right onto the ForestGrove/Canim Lake Rd. Turn right onto the Canim Lake Road. Just before arriving at Canim Lake, turn south (right) and follow the road on the south side of Canim for about 8 km (5 mi.). Turn south (right) again and follow this steep access to Howard. This "trophy" lake can yield rainbow up to 5 lbs and more. Irish Lake: At 93 Mile, turn east off Hwy 97 onto Hwy 24. Travel to the town of Lone Butte. Continue east on Hwy 24 for another 3.2 km (2 miles). This is a popular fly fishing lake because of the abundance of invertebrates throughout the lake and good rainbow fishing. Jacobie Lake: At 150 Mile House, turn east onto the Horsefly Rd. A couple of miles later, turn left onto the Likely Rd. Turn right on Jacobie Lake Forestry Rd. Jacobie Lake is a great family lake, especially for the young fisherman. The rainbows may not be large, but there are lots of them. Kappan Lake: From Williams Lake take Highway 20 to Anahim Lake. Kappan Lake is located about 15 km (9.3 mi) south of Anahim Lake on a good gravel road. This 4 mile long lake contains only wild stock rainbow trout. Klinne Lake: At 150 Mile House turn east off Hwy 97 onto the Horsefly Road. Travel past the village of Horsefly and continue along the Horsefly-Quesnel Lake road. This spring-fed lake can produce rainbows averaging 2 lbs and more. Kloacut Lake: At Williams Lake turn west onto Hwy 20, to Hanceville (aka Lee's Corner). Turn south off Hwy 20 and travel south past Fletcher Lake. Then turn southwest from Big Creek past Willan Lake. Wild rainbows up to 8 lbs and sometimes even larger taken at Kloacut Lake. Konni Lake: At Williams Lake turn west on Hwy 20, to Hanceville (a.k.a. Lee's Corner). Turn south off Hwy 20, crossing the bridge over the Chilcotin River. Take the Taseko Lake Road and follow it to the Big Lake/Konni Lake Road and follow it to Konni Lake. Wild Rainbows average 1 1/2 lbs with some up to 5 lbs or better can be caught in Konni Lake. Lac Des Roches: At 93 Mile, turn east off Hwy 97 on to Hwy 24. Travel east on Hwy 24 for 50km to reach the west end of the lake. Lac Des Roches traversing hwy 24 for 9 miles with access roads for various resorts (along with all the other lakes in this region) is also accessible by taking the Yellowhead Hwy north from Kamloops and then turning left (west) onto Hwy 24 at Little Fort. It is also accessible from Hwy 5. The game fish at Lac Des Roches are Kamloops Rainbow and Gerrard Trout. Lac La Hache Lake: North of 100 Mile House, this 20 km (12 mi.) long lake runs along the west side of the highway with the townsite of Lac La Hache on the south east corner. Lac La Hache is known for it's kokanee fishing, although rainbow and lake trout are often sought after. Lessard Lake: From Anahim Lake, go north towards the Dean River. An excellent lake for wild stock rainbows. Sizes range from 2 to 4 lbs, although they can be much larger. Little Big Bar Lake: From Clinton take the Meadow Lake road then turn left at the 4way intersection. Travel south on this unnamed road for 9.l kms (5.6 miles) and turn right. Travel west passing the Big Bar Lake provincial campsite turn right and travel north to the Little Big Bar Lake. Subject to winterkill none the less Little Big Bar offers a fine fishery for rainbow to 2 lbs. Lorin Lake: From 100 Mile House, proceed north on Highway 97, turn east on the Forest Grove/Canim Lake Road. Follow the Mahood Lake Road on the south side of Canim Lake and then branch south on the Bowers Lake forest access road. After 10 km (6.2 mi) take a right fork. Popular fly fishing lake has good rainbow fishing because of the abundance of invertebrates throughout the lake. Machete Lake: At 93 Mile, turn east off Hwy 97 on to Hwy 24. Follow Hwy 24 past the turn off to the Bridge Lake Store. Continue east for another 4.5 km. (2.8 miles) and turn right (south). Rainbows in the 2 lb range are caught in Machete Lake. Mahood Lake: To access the lake from 100 Mile House, follow the Horse Lake Road east to the junction of the Mahood Lake road and the Canim Lake S. road. Large wild rainbows up to l0 lbs, and lake char that reach 20 lbs or better at Mahood Lake. Marmot Lake: Marmot Lake is located west of Quesnel on the Nazko Road. As the fish often tend to be muddy, many find catch-and-release the best type of fishing for this Marmot Lake. With the rainbow averaging around 2 lbs and often reaching up to 8 lbs. Milburn Lake: Take Hwy 97 to Quesnel. Cross the bridge over the Fraser River to West Quesnel. Turn right on Bouchie Lake Road. Milburn Lake is a good producer of Rainbows in the 1 - 2 lb range. Eastern Brook Trout are in the 2 lb range. Needa Lake: At 93 Mile, turn east off Hwy 97 onto Hwy 24. Follow Hwy 24 to Sheridan Lake. Needa is located north of Sheridan. Needa contains wild stock rainbows and lots of them, most average the 1 1/2 lb. Nimpo Lake: At Williams Lake turn west onto Hwy 20. Nimpo is located approximately 290 km (180 mi.) from Williams Lake on Hwy 20. An excellent lake producing 3 pound rainbows on the fly or by spinning and trolling methods. Palmer Lake: At Williams Lake turn west onto Highway 20. Turn north off Hwy 20 onto the Palmer Lake Forest Access Road. Palmer Lake is a very consistant producer of 3 lb rainbows throughout the season. Much larger trout are not uncommon. Pressy Lake: At 70 Mile House turn east off Hwy 97 onto the Green Lake road. Take the south (right) road at the Y just before Green Lake. Pressy Lake is a good producer of rainbows up to 2 lbs. Puntchesakut Lake: From Quesnel, cross over the Fraser River and head west on the Nazko Road for 35 km (21 mi). The wild stock rainbow trout in Puntchesakut Lake can reach about a pound, although they are known for being quite elusive. Puntzi Lake: At Williams Lake turn west onto Hwy 20. Follow Hwy 20 until you are 64 km (39.7 mi) west of Alexis Creek. Turn north off Hwy 20. Much effort has gone into Puntzi's Kokanee and Rainbow enhancement program. As a result, Puntzi is a consistant producer of 1 1/2 lb (and better) Kokanee and Rainbow. Quesnel Lake: Turn east off Hwy 97 at 150 Mile House onto the Horsefly Rd. Continue to the major intersection of paved roads, then turn left (northeast) onto the Likely Road. From here you can access the northern portion of the lake. Rainbows, Dolly Varden, Lake Char, and Kokanee are found in Quesnel Lake. Rail Lake: From 100 Mile House, travel north on Highway 97 to Lac La Hache. Turn east on the Timothy Lake Road, after about 6 1/2 km (4 mi.) branch to the left for about 13 km (8 mi.) on a good all weather gravel road. This rehabilitated lake reports rainbows to 3 lbs and is fairly consistent throughout the season. Rainbow Lake: Rainbow is 322 km (199 mi) west of Williams Lake on Hwy 97. Rainbow Lake contains wild stock rainbows in the 2 to 4 lb range. Raven Lake: About 21 km (13 mi) west of Riske Creek turn off Hwy 20 onto Palmer Lake Forest Access Rd. Raven is located on the Palmer Lake Rd. Eastern Brook Trout averaging around 2 lbs Rainbows up to 5 lbs, and sometimes larger at Raven Lake. Scum Lake: At Williams Lake turn west onto Hwy 20 Hanceville (a.k.a. Lee's Corner) then turn off the highway and travel south crossing a bridge over the Chilcotin River. Turn right on the Taseko Lake Road. Wild rainbows averaging 1 1/2 lbs are caught at Scum Lake from May to July and September through October. Sharpe Lake: Follow Hwy 24 to the Bridge Lake Store, turn right (south) onto a gravel road and stay on the left branch of the fork. Follow this road until you reach Eagan Lake at which time you take the right branch of the fork. Sharpe is found on your south (left) side. Sharpe is a small lake that regularly treats the flyfishers with rainbows up to 5 lbs. Sheridan Lake: From 100 Mile House, travel south on Highway 97 until you meet the junction of Highway 24. Take this scenic paved road east for to reach this 3 km (2 mi.) long lake. Sheridan Lake has the reputation as a producer of large rainbows. Spanish Lake: 134 km (83 mi) northeast of Williams Lake. Spanish produces good quantities of wild rainbows and Dolly Varden. Spanish is also a great lake to take the family, children will always catch fish. Sulphurous Lake: At the southern edge of 100 Mile House, turn east off Highway 97 onto the Horse Lake Road. Watch for the signs, then proceed northeast on a good gravel road to Sulphurous Lake. This 6 1/2 km (4 mi.) long lake reports rainbow up to 5 lbs with an average of 3 lbs. Tatla Lake: At Williams Lake, turn west onto Hwy 20 and travel to the community of Tatla Lake. Tatla Lake is a popular Kokanee fishery with sizes averaging 14-16 inches. Ten Mile Lake: From Quesnel, travel north on Highway 97 for approximately 11 km (7 mi.). The lake is located to the west of the highway. The rainbow in Ten Mile Lake will often go to 5 lbs. Although fishing slows down in the summer, September and October often prove very productive. Till Lake: At Williams Lake turn west onto Highway 20. Cross the Fraser River and travel up the Sheep Creek Hill. At the top of the hill turn off Hwy 20 onto the Meldrum Creek Road. Till is a rainbow stocked lake with reports of 6 lb fish being caught. Timothy Lake: Turn east off Highway 97 at Lac La Hache and travel 13 km (8 mi.) along a good gravel road to reach this 8 km (5 mi.) long lake. Rainbow trout up to 3 lbs can be caught in Timothy Lake. Tiltzarone Lake: From Quesnel turn west off Highway 97 onto the Nazko road. The wild stock rainbow in this lake can reach up to 5 lbs at Tiltzarone Lake. Tsuniah Lake: At Williams Lake turn west onto Hwy 20. Turn south at Tatlayoko Lake Road. Continue past the turn off to Cochin Lake and then turn east on to the Chilko Lake Access Road. Drive past Choelquoit Lake and continue south for a short distance as if going to Chilko Lake. Turn east at Henry's crossing and follow this road right to Tsuniah Lake. Fast paced action for wild rainbows in the 1 to 2 lb range at Tsuniah Lake. Turner Lake: A rough 4 by 4 road turns off Highway 20 in Tweedsmuir Park and follows the Atnarko river south. Turner Lake is primarily a cutthroat fishery. Anglers report excellent results with cutthroats ranging between 1 and 2 lbs at Turner Lake. Tzenzaicut Lake: From Quesnel, cross the Fraser River and head south on the West Fraser Road, eventually crossing west over Narcosli Creek. Flies, spinning tackle or trolls are preferred to catch these wild stock rainbow that can reach from 10 - 15 inches. Valentine Lake: At the north end of 100 Mile House, turn west off Highway 97 onto the Exeter Road. This alkaline lake produces rainbow up to 8 lbs although the norm is around 4 lbs. Vedan Lake: At Williams Lake turn west on Hwy 20, to Hanceville (a.k.a. Lee's Corner). Turn south off Hwy 20, crossing the bridge over the Chilcotin River. Take the Taseko Lake Road. Wild Rainbows averaging in the 2 lb range with some going to 5 lbs. The main attraction at Vedan Lake are the Bull Trout which go up to 15 lbs. Watch Lake: From the north, access is east off Highway 97, on Highway 24. At Lone Butte, take the turnoff south to Watch Lake. From the south, at 70 Mile House, turn east off Highway 97 onto the Green Lake Road. While most catches are about 1 lb at Watch Lake, rainbows up to 7 lbs have been recorded. Wolverine Lake: From the Quesnel River Bridge at Likely, travel NE for 1 mile and turn left. Keep on the main road (Keithly Creek Rd.) for another 7.9 miles and then turn left onto the Jacobsen Bros. logging road. For this for 2.2 miles and then turn right. It is 0.1 miles to the lake. The game fish are Trout and Lake Char at Wolverine Lake.